A 24-hour clock displayed on an oscilloscope configured as a vector monitor in X-Y mode with dual R2R DACs to generate the analog voltages. A vector monitor or vector display is a display device used for computer graphics up through the 1970s. It is a type of CRT, similar to that of an early oscilloscope. In a vector display, the image is composed of drawn lines rather than a grid of glowing pixels as in raster graphics. The electron beam follows an arbitrary path tracing the connected sloped lines, rather than following the same horizontal raster path for all images. The beam skips over dark areas of the image without visiting their points. 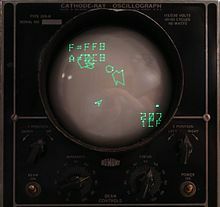 In 1970, at the UK Farnborough Air show, Sperry Gyroscope (Bracknell, England) exhibited the first ever vector graphic video display from a UK company. It featured an analogue monochrome display with special electronics, designed by Sperry's John Atkins, allowing it to draw vectors on screen between two pairs of coordinates. In the USA at MIT in 1963 Dr Ivan Sutherland had used similar techniques for his Sketchpad program. At Farnborough the display was used to demonstrate the capabilities of the new Sperry 1412 military computer - it was shown running software that drew, in real time, a wire-frame rotating cube that could be speed-controlled in any of its three dimensions. That demonstration created significant interest in the Sperry 1412 computer, which then went on to be at the heart of a number of major projects for the French Navy and the Royal Navy during the period 1972 to 1992. Some refresh vector displays use a normal phosphor that fades rapidly and needs constant refreshing 30-40 times per second to show a stable image. These displays such as the Imlac PDS-1 require some local refresh memory to hold the vector endpoint data. Other storage tube displays such as the popular Tektronix 4010 use a special phosphor that continues glowing for many minutes. Storage displays do not require any local memory. In the 1970s, both types of vector displays were much more affordable than bitmap raster graphics displays when megapixel computer memory was still very expensive. Today, raster displays have replaced nearly all uses of vector displays. Vector displays do not suffer from the display artifacts of aliasing and pixelation (especially, B&W ones; color displays keep some artifacts, due their discrete nature). But they are limited in that they can display only a shape's outline (advanced vector systems can provide a limited amount of shading). Text is crudely drawn from short strokes. Refresh vector displays are limited in how many lines or how much text can be shown without refresh flicker. Irregular beam motion is slower than steady beam motion of raster displays. Beam deflections are typically driven by magnetic coils, and those coils resist rapid changes to their current. Notable among vector displays are Tektronix large-screen computer terminals that use direct-view storage CRTs. Storage means that the display, once written, will persist for several minutes. (The CRT has at least one flood gun, and a special type of display screen, more complicated in principle than a simple phosphor.) But that permanent image cannot be easily changed. Like an Etch-a-Sketch, any deletion or movement requires erasing the entire screen with a bright green flash, and then slowly redrawing the entire image. Animation with this type of monitor is not practical. Vector displays were used for head-up displays in fighter aircraft because of the brighter displays that can be achieved by moving the electron beam more slowly across the phosphors. Brightness is critical in this application because the display must be clearly visible to the pilot in direct sunlight. Vector monitors were also used by some late-1970s to mid-1980s arcade games such as Asteroids, Tempest, and Star Wars. Atari used the term Quadrascan to describe the technology when used in their video game arcades. Hewlett-Packard made a large-screen fast vector monitor, which they called an X-Y display. It uses a wide-angle electrostatically-deflected CRT that is about as compact as a magnetic-deflection CRT. Instead of the deflection plates of a typical CRT, it has a unique structure called an electrostatic deflection yoke, with metallized electrodes inside a glass cylinder. Some vector monitors are capable of displaying multiple colors, using either a typical shadow mask RGB CRT, or two phosphor layers (so-called "penetration color"). Atari used the term color quadrascan to describe the shadow mask version when used in their video arcade games. In the penetration tubes, by controlling the strength of the electron beam, electrons can be made to reach (and illuminate) either or both phosphor layers, typically producing a choice of green, orange, or red. Tektronix made color oscilloscopes for a few years using penetration CRTs, but they apparently weren't in great demand. ^ Van Burnham (2001). Supercade: A Visual History of the Videogame Age, 1971-1984. MIT Press. ISBN 0-262-52420-1. ^ "Atari's New Color Quadrascan (X-Y) Monitor" (PDF) (Press release). Atari Incorporated. 1981-09-24. Retrieved 2012-05-06. ^ "Wells-Gardner 6100 Vector Monitor FAQ and Guide" (PDF). 2002-03-01. Retrieved 2012-05-06. This page was last edited on 7 January 2019, at 07:02 (UTC).